First Published in the Austringer, Journal of the Welsh Hawking Club 1974. 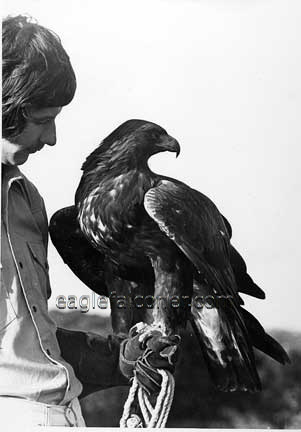 It was on re-reading the 1973 edition of the AUSTRINGER, and particular an article by Mr Roy Saunders on Tatra's free flights from "Craig y Fyddai" that inspired me to write on my similar experience with a Golden Eagle. For four years I flew an eagle over the headlands of the Channel Islands, our quarry was not, unfortunately, the cunning fox, for they became extinct in the islands long ago. We hunted the rabbits which lived on the bracken covered cliff tops. My most memorable flights were over the cliffs of Herm island. Herm being almost deserted in winter, is a falconer's paradise. We would spend a week or more each season on the island at the kind hospitality of the tenant, Major A.G. Wood. Hunting would start each day at about eight in the morning, the goshawks would head for the more sheltered parts of the island. Ivan my male adult golden eagle would head for the wind, he was too impatient to stay on the fist while I lumbered over the fields to the clifftops, he would fly low over the fields and out of sight. The wind was coming from the east across the sea from the mainland of France, we were in for a good day as the east cliffs stretch the length of the island. As I got closer to the headland I could feel the wind getting stronger and could hear the faint rumble of the sea. It was a beautiful day, the warm winter sun was a pleasant change to the unceasing rain we had left behind us on the larger island of Jersey. I broke my way through the brambles and bracken beating all likely rabbit hiding places, I had barely covered twenty yards and a rabbit made a move. 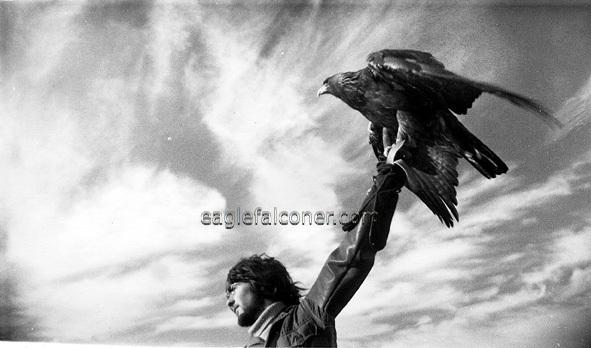 I whistled for the eagle, he was high above enjoying the sea air, and his attention seemed to be far away. He dropped altitude fast and levelled out at about thirty feet to hang above the spot where the rabbit had disappeared. We continued, Ivan now working at a sensible height, he quartered the ground in front of me his head moving from side to side as he searched for any movement on the ground below. Every now and then he would sail back and wait on the wind above where I was beating. If he caught sight of a rabbit moving in the cover below, he would roll over and stoop with closed wings, crashing into the bracken. Often missing as the bracken was strong and the ground riddled with holes, but the power of the attack was exciting. I would find him driving his talons into the ground venting his temper, then feeling the call of the wind he would open his wings, release his grip and lift high into the sky. 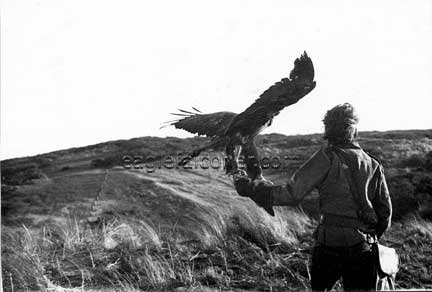 If the quarry proved to be scarce he would play on the wind, stooping at a hill top to grab turfs or clumps of bracken tearing them from the ground, then to rise high into the sky and play drop and catch for a minute or so, then to drop the clump onto the rocks below often scattering the gulls. The resident gulls would often mob, but he took little notice of them and they soon became tired of the game. Occasionally he would stoop at a great black backed gull, or raven. I was also included in the fun and games, he seemed to find it amusing to see me dive for cover as he vertically stooped from the sky in my direction. It was on a day like this that I witnessed a sight closer than any person could have wished. The rabbits were scarce on the head lands that particular afternoon, I had become tired of beating, and was laid back on a large boulder enjoying the warm winter sun. Ivan was playing with the herring gulls on a strong sea breeze, and I was not paying much attention to him at the time, in fact I was beginning to feel sleepy in the warm sun. I felt I had better make a move before I should drop off completely, I walked down the hillside, it was very steep and I was picking my steps very carefully, Ivan, seeing at last that I was making a move, glided closer. Suddenly I slipped, and was on my back, one foot came to rest between two rabbits, they both bolted up hill. One up my left the other up my right side, I made a grab for the one coming up on the right, I missed, but Ivan didn't, and he hit it as it passed within two feet of my head. I froze as the unfortunate rabbit breathed his last, with the eagle's primaries spread across my face. I waited a few minutes while he broke into the rabbit, then I moved sideways as slowly as possible until I felt that I was far enough away to get up and make in. I breathed a great sigh of relief when finally I stood with the eagle on my fist and the rabbit in the bag. These daily flights often lasted all day, with the eagle landing no more than six or seven times unless diving at rabbits, it kept him very fit and he slept well at night, the journeys back to camp at night were always via The Mermaid Tavern, Ivan found this a welcome break for a nap for an hour or two, undisturbed by a group of excited falconers discussing the days flights and many close misses.